Matt’s journey was not without disappointment. How could it be? This is wrestling. Distinguished accomplishments do not come with talent alone. It requires refining technique, quickening reflexes, building stamina, strengthening muscles and learning a library of moves and counters. Every wrestler, even the most experienced and talented, has their nemesis — a Nicholas Anthony — in their path. While sixty-eight bouts and eighteen month’s experience is a great start, it’s rarely enough take on a talented opponent with many years experience. Yet, to win, he would have to defeat one or more opponents of that caliber. It was only after Steven’s full court press for Matt to join the Middle School wrestling team as a seventh grader did Matt finally relent. “If it wasn’t for my brother, I would have never joined the team. He thought I would be good at it,” said Matt. “I didn’t want to add another sport to my schedule.” His brother had a slightly different take on it: “Matt never wrestled before 7th grade, and he’s very athletic and good at all these other sports, so I think it scared him a little bit to go out for a sport that he never tried.” The wrestling uniform may have been a factor. “I don’t think he liked the idea of wearing a singlet in front of everyone,” said Steven. After Matt’s promising 13-0 first middle school wrestling season, varsity coach, Gary Pesko thought he was ready to wrestle on the varsity team. “Matt is an athlete with a lot of natural ability,” said Coach Pesko. “He’s very competitive.” Matt mostly competed in JV this past season. He struggled and even took some lumps, but managed to produce a winning 23-19 record. With the end of the varsity season in February, the club season began. Matt understood that he was going to have to outwork his competitors who have been practicing and competing in the Pee Wee programs since the early ages of four or five. There was a lot of catching up to do. Inspired by his brother’s dedication and work ethic, Matt committed to an offseason that would prove longer and more competitive than the regular one. Matt’s 68 matches were just shy of the Sayville offseason record of 71, held by Shawn Mazzarone. He put together an impressive 55-13 record culminating with his participation in the Schoolboy Nationals. The journey to Schoolboy Nationals in Orem, Utah begins by competing in a series of qualifying tournaments. First there are local tournaments leading to a state tournament. Finishing in the top three of the state tournament qualifies the wrestler to compete in the regional. A top three finish in the regional tournament qualifies the wrestler for the National Tournament. Only the best-of-the-best earn the privilege to compete in Utah. Along the way to Utah Matt competed against the highly touted Rochester area wrestler, Derek Draper, four times. In the Northeast Regional, round- robin, Freestyle match, Matt avenged an earlier loss to Draper suffered in the New York State Freestyle finals. In the Freestyle finals, Matt squared off against Nicholas Anthony, the eventual silver medalist in Utah. Anthony comes from the Keystone state of Pennsylvania, notorious in the wrestling community for their prowess. Anthony is an accomplished wrestler having competed since a youngster. 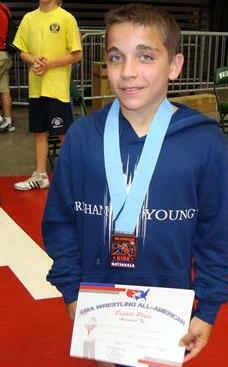 Last year, he won the silver medal at the Northeast Regional Championship. Without a doubt, Anthony was going to be Matt’s toughest offseason opponent. Anthony’s formidable experience proved too much for Matt to handle as he lost the finals bout decisively in two periods. He would get one more shot at Anthony in Utah. After earning three Silver Medals and one Gold in the qualifying tournaments, Matt was ready to make his mark in Orem Utah on June 30th and compete in both the Schoolboy Greco-Roman and Freestyle championships. He would compete against wrestlers who’ve been here before. Some came to defend their crown; others came to improve upon their former performances. All came to win. The next day, on July 1st, Matt competed in the Freestyle Championship. Freestyle is Matt’s favorite of the three wrestling styles. If he was going to earn All American honors in Freestyle, however, it was going to be more challenging. His first round opponent was Nicholas Anthony. Would he avenge his earlier loss? “I knew if I lost, I would be immediately in a hole,” said Matt. As he feared, the match did not go his way. “I wasn’t surprised. He was more skilled than me,” said Matt. With the pressure on, Matt fought his way back to the medal round to earn All American honors and to once again compete for seventh place. Again, he faced Thaddeus Nelson for seventh. “I thought I could win. I didn’t think I wrestled well in the Greco match,” said Matt. Nelson defeated Matt in two rounds by the slimmest of margins winning the first round in a tie breaker and winning the second round by the score of 1-0. “I was mad. I was trying to shoot the entire 2nd period, but I just couldn’t get in on him,” said Matt. Matt’s offseason accomplishments did not go unnoticed by USA Wrestling: they awarded him a 13th rank in the U.S. Future Olympians at 91lbs, Schoolboy Division. With the dawn of the 2010 season upon us, Matt will continue his journey with an eye towards an eventual state championship. Along the way there will be many challenges, obstacles and perhaps another Nicholas Anthony in his path. Difficult journeys are seldom straight paths. To reach the final destination, there are often curves to navigate, mountains to climb, and unexpected challenges to surmount. With persistence, hard work, and plenty of desire an athlete puts themselves in the best position to achieve what is possible. Realizing the challenges, tasting success, and understanding the opportunity, Matt is devoted to take his game to the next level. Wherever his final destination, he will be building the skills and living the experiences that will carry him for a lifetime. And if only for that, it’s worth it. Editors Note: On August 6th, Matt broke the Sayville off season matches with 73. The record was broken at the Midnight Madness Tournament in Long Branch NJ. This kid is going to be a stud. Should be one of the favorites next year at 98. Heard rumblings all Spring that Sayville has a handful of young guns coming up. They had large numbers everywhere at every tournament. Heard this kid is the best kept secret on Long Island.